Brief：50 CEOs of China's largest companies discuss larger investments in the Egypt, saying "the country's market is large and ripe for growth. The Egyptian-Chinese Economic Cooperation Forum kicked off Thursday in Cairo to discuss investment oppurtunities in Egypt, Ahram Arabic news website reported. The Chinese delegation is headed by Wu Baocai, vice-president of the China Economic Cooperation Centre, Sui Zhengjiang, vice-mayor of Beijing, and Song Aiguo, ambassador of China in Egypt. The forum is organised by the Egypt's General Authority for Investment (GAFI) in cooperation with the Egyptian Businessmen Association. 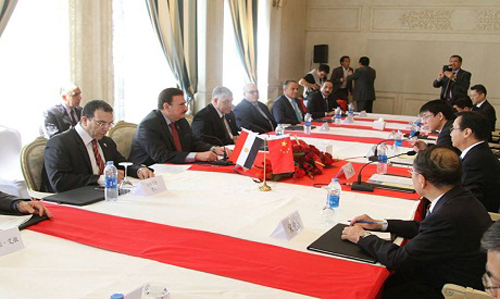 The Chinese business delegation, which is comprised of 50 CEOs of the largest Chinese companies, will explore with the Egyptian side about potential investment opportunities the fields of transportation, agriculture, tourism, and petrochemicals. Members of the Chinese delegation represent 22 of the country's provinces. The Egyptian side at the forum included prominent Egyptian officials and public figures such as Mohamed Khodeir, the head of Egypt's General Authority for Investment, former PM Essam Sharaf, and the Chairman of Al-Ahram organization Ahmed El-Sayyed El-Naggar. Khodier explained in the meeting latest economic reform policies adopted by the Egyptian government to improve the investment environment in the country. 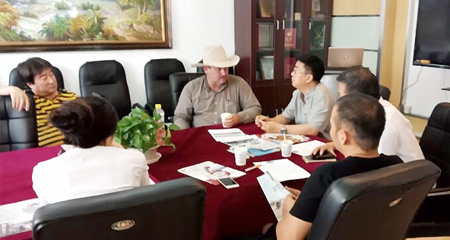 El-Naggar, an economic writer, praised Beijing's international economic policies, describing China as the most powerful economy in the world at the present. He also said the 2013 "Belt and Road" initiative launched by the Chinese president represents a great opportunity to end the dollar's dominance over the global market. The vice-president of the China Economic Cooperation Centre expressed his country's keenness to increase investments in Egypt during the upcoming period, saying Egypt has a large-scale market full of business opportunities. Egypt and China have forged strong economic and political ties since the election of President Abdel-Fattah El-Sisi in 2014. The Chinese official highlighted during discussions at the forum the participation of major Chinese companies in the execution of mega projects in Egypt such as the new administrative capital, the 1.5 million feddan agricultural reclamation projct as well the Suez Canal Axis development project. In October, Egypt signed a framework agreement with China Fortune Land Development (CFLD) to complete the second and third phase of construction in the new administrative capital mega project east of Cairo with an investment of $20 billion. The construction in the first phase of the new capital project started in April by local construction companies and is expected to be completed in 2018. On Sunday, Egypt's Central Agency for Public Mobilisation and Statistics (CAPMAS) issued a report on trade exchange between Egypt and East Asian countries for 2015, showing China led all of Cairo's East Asian trade partners in exports to Egypt at EGP 74.8 billion. Electrical equipment, machinery, mechanical appliances and spare parts were the top imported items by Egypt from China in 2015. There are 1,300 Chinese companies currently operating in Egypt with nearly half a billion dollars worth of investments, according to Ahram Arabic news website.